Say what you will about Tom Cruise, but one thing that you have to acknowledge, he is one savvy player when it comes to his film career. Like Sandra Bullock, Cruise relies on his instincts and has total control over the steps he takes and the films he makes, which are invariably commercial. His latest, director Christopher McQuarrie’s Mission: Impossible – Fallout — McQuarrie has teamed with Cruise on Mission: Impossible - Rogue Nation and Jack Reacher (and provided scripts for Edge of Tomorrow, The Mummy and Valkyrie) — is yet another box office smash. With that said, word arrived this past week from Paramount Home Media that Mission: Impossible – Fallout will be available as DVD, Double-Disc Blu-ray/DVD Combo Pack and 4K Ultra HD/Double-Disc Blu-ray Combo Pack product offerings on Dec. 4. That early December street date yields an ARR of 130 days and multiplex summer crowds chipped in $219.2 million in domestic box office sales — $790 million if you look at the worldwide picture. The film is remarkable beyond the storyline and the action itself. 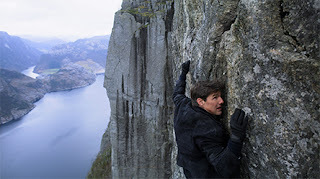 Tom Cruise does his own stunts and was injured during the rooftop chase sequence (broken ankle, etc. ), which shutdown the film for seven full weeks. The HALO jumps (High Altitude Low Opening) in the film that featured Cruise were real, however they were not done over the city of Paris (that was digitally painted in). 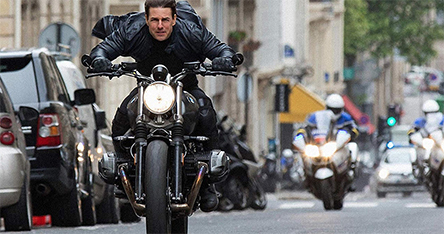 As to bonus features for this sixth installment in the Mission: Impossible film series, we begin with three — count’em, three — commentary options. 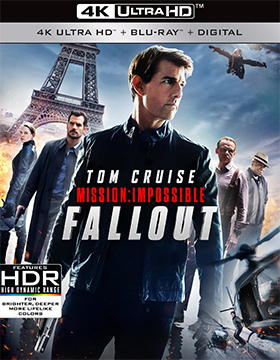 The first features director Christopher McQuarrie and producer/actor Tom Cruise, the second also has McQuarrie, who is joined by film editor Eddie Hamilton (he also edited Mission: Impossible - Rogue Nation and the two Kingsman films), and the third features commentary from composer Lorne Balfe. To get all of this extra material included in the release, both the 4K Ultra HD and Blu-ray SKUs include a second Blu-ray companion disc. In other home entertainment release news from Paramount Home Media this past week, the Comedy Central production of Nathan For You, starring comedian Nathan Fielder — who also just happens to have a degree in business — as a very unconventional “business consultant.” His advice, while well-meaning and sincere, is often askew, which creates for very funny running skits. MVD Entertainment Group just announced it next Rewind Collection Blu-ray release and it will certainly be a keeper come Dec. 11. 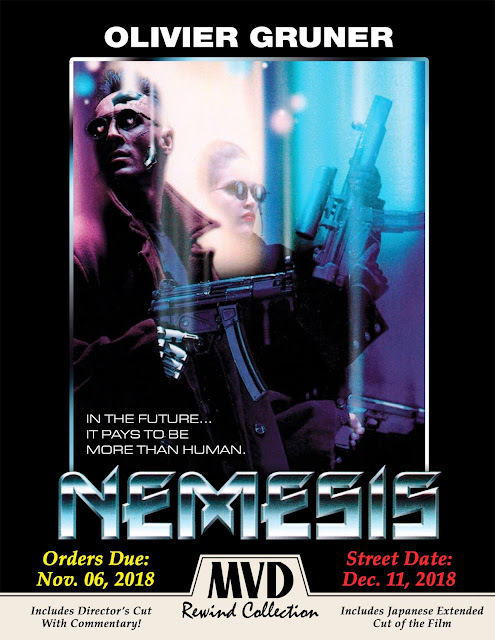 Director Albert Pyun teams up with Olivier Gruner for the 1992 sci-fi thriller, Nemesis, which will be a double-disc presentation, featuring three different cuts of the film … the original theatrical cut, a director’s cut and the Japanese Extended cut of the film. Sweet! 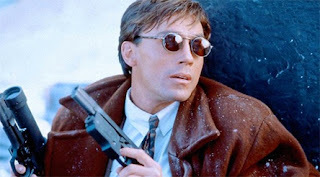 Both filmmaker Albert Pyun and French kickboxer-turned-actor, Olivier Gruner have already been showcased by MVD Entertainment Group, with Pyun’s Crazy Six (starring the late Burt Reynolds) getting a Marquee Collection Blu-ray launch on Aug. 28 and Gruner’s all-action Angel Town going the Rewind Collection route on Sept. 25. As the film progresses and Alex gets repaired and repaired and repaired (like that bunny, he takes a licking and keeps on ticking) we come to learn that the “Hammerheads” are actually the good guys and that there is a sinister plot afoot to replace key humans with android lookalikes. 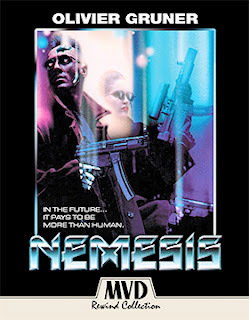 Nemesis clearly takes its cues from the Terminator franchise (Terminator 2: Judgment Day was released theatrical the previous year), but dials the action up several notches. 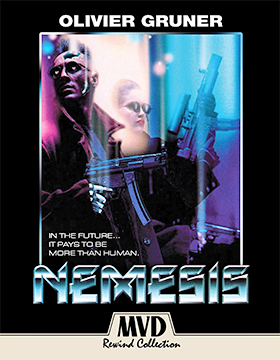 Nemesis works and it is certainly an enjoyable thrill ride … especially trying to keep up with who is who … android replicant or human! Icarus Films and Bullfrog Films will team on Nov. 20 for the DVD debut of documentary filmmaker Guy Reid’s (with Steve Watts Kennedy) Planetary. 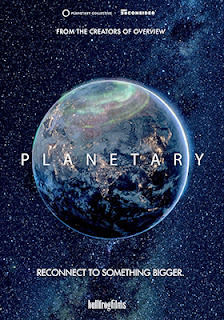 The idea for this film sprung from Reid’s 2012 short film, Overview, which examined the experience reported by astronauts when viewing Earth from hundreds of miles in space. Dubbed the “Overview Effect,” Earth is seen in a different light — from a different perspective if you will — which is often described as seeing a fragile, life-sustaining orb floating in the vastness of an endless space. 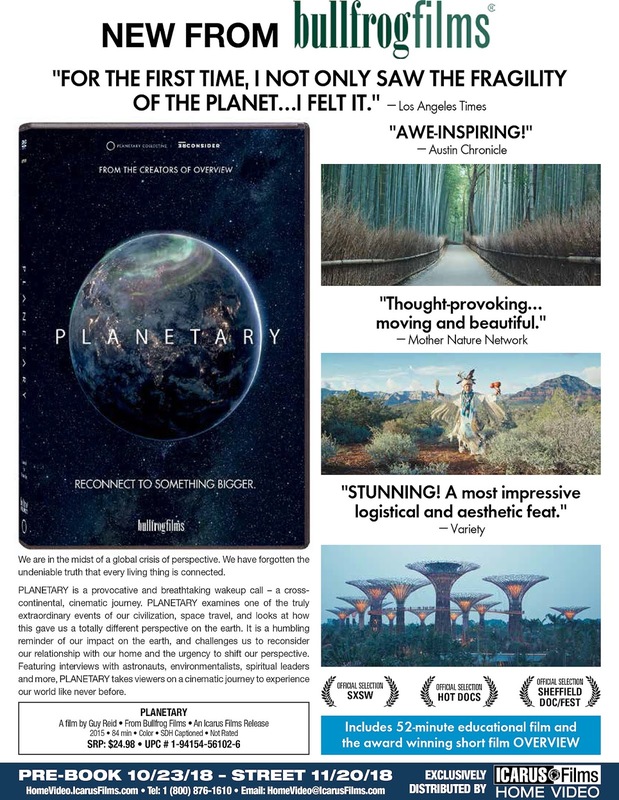 The film was so well-received, Reid decided to expand the discussion of this view of our planet and the implications thereof and include not only observations from astronauts, but from philosophers and the like. So that it wouldn’t just be a group of “talking heads” discussing an esoteric idea (read that as: boring), Reid teamed with photographer-turned-cinematographer Christopher Ferstad to juxtapose the stunning visuals from space with equally magnificent shots of our planet and then mix in the hustle and bustle of human endeavors on a global basis — cities, people at work and play, roads, airports … the scope of humanity. The result is a thought-provoking examination of the “Overview Effect” and the current state of human existence on this fragile floating orb. The point that is examined is that we are all interconnected. Contributing to the conversation are astronauts Ronald Garan and Mae Jemison, who are joined by the likes of natural resource management professor and author, Janine Benyus (“Biomimicry: Innovation Inspired by Nature,” “The Field Guide to Wildlife Habitats of the Eastern United States”), Zen Buddhist instructor Joan Halifax (“The Fruitful Darkness: Reconnecting With the Body of the Earth”) and author Paul Hawken (“The Ecology of Commerce: A Declaration of Sustainability,” “Natural Capitalism: Creating the Next Industrial Revolution”) … among others. 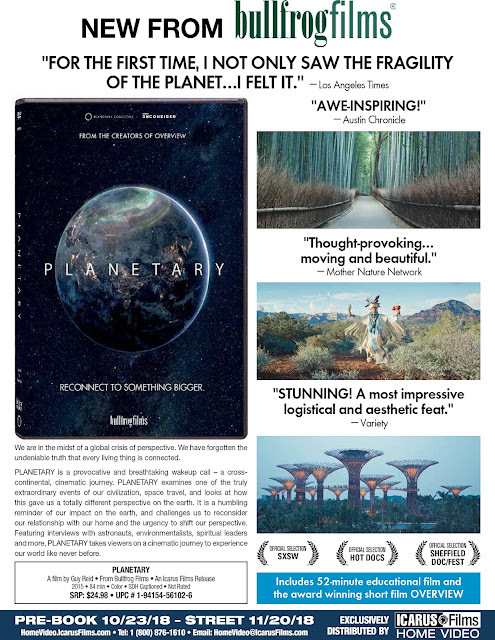 Included with the DVD release of Planetary is the aforementioned short film from Guy Reid, Overview.